Isn’t Liguria gorgeous? 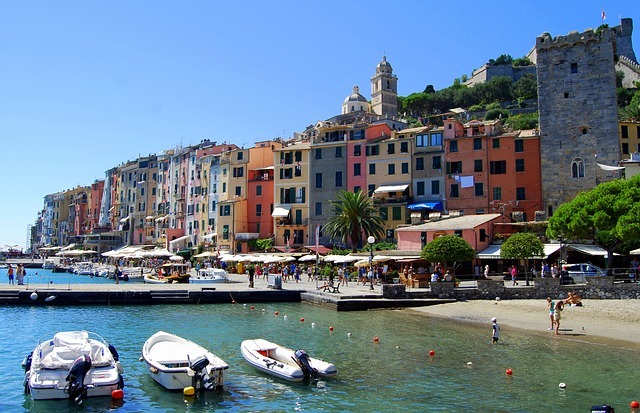 Home to the gorgeous towns of Portofino, Cinque Terre and food like foccacia and basil pesto. So many delicious dishes have come out of Liguria but this has to be one of my favourite Italian dishes. The first time I ate it was about 10 years ago when friends of Fabio invited us to have lunch at their home. 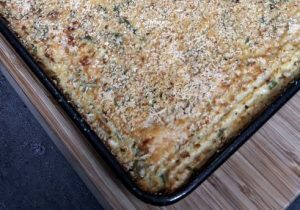 Each time we’ve gone since they’ve made a different recipe – you can literally put any combination of vegetables in this. The last time we went for lunch we had torta verdura with eggplant and mushrooms. It was absolutely delicious. I think the keto version actually makes for a much rounder meal because the pork rinds give the dish more fat and protein than the original. Butter Preparation Cut the celeriac into cubes (the smaller the faster they’ll cook through) and put them to boil, starting with cold salted water. Cook until they can be easily pierced with a fork (20 minutes or so). In a separate pot set the green beans to boil, starting from hot salted water, if you’re a stickler for rules… otherwise cold is fine too. Don’t let the green beans cook too long, they need to be still firm, not soft. 10 minutes max. Pour a bit of olive oil in a small pan, add the finely chopped onion and fry until translucent (shiny). Don’t worry if they brown a little bit, it adds extra flavour. When ready, strain the beans, and set aside in a bowl to cool down. Pour the pork rinds (a full bag), half of the grated cheese, salt and pepper in a food processor and prepare the “breading”. Move into a small bowl. Once the celeriac is well cooked, but still keeping the shape, strain it and use the same food processor as in the previous step to reduce it to a mash. Move it into a large bowl. Cut the green beans into small bits and add them to celeriac, add also the fried onion to the mix. Add the herbs mix, the chopped mint (if fresh) or crumble the dried mint in, add the eggs and start mixing. Gradually add the cheese, have some extra grated cheese ready in case the mix is not firm enough. When you are satisfied that the mix has the right consistency (like mashed potatoes) to be picked up with a spoon without any liquid dripping, start preheating the oven to 180 degrees Celsius. In the meantime, cover the whole oven tray with a thin layer of butter (or olive oil) and pour half of the breading into the tray. Shake the tray well to make sure that the breading sticks to all sides and the whole bottom of the tray. Using a spoon move the mix into the tray, do not drag it around, just place it in the tray as evenly as possible trying to keep it at the same thickness all over. Once the tray is full, and you feel fancy, score the surface of the mash with the back of a fork (I usually do it in a crossing pattern). Pour the remaining breading and shake well to cover the whole surface of the torta. If some corners are missing the breading, just add some more grated cheese. Put in the oven for 40 minutes or so (keep an eye on it). Once you are satisfied that the smell and colour are what you want (an even light brown), crank up the heat and switch on the broiler. Move the tray up, closer to the heating element, and let it broil (grill) for and additional 5 minutes until crispy and darker brown. Remove the torta from the oven and let it cool down for 20 minutes/ half an hour before serving it. It can be eaten cold too. Keeps in the fridge for 2 days max, so get eating! Let them sit for a few minutes and then serve them with a salad, or whatever side dish you fancy. Post your pictures on social media and tag #ketochristina or #mrketochristinacooks Buon appetito!